can become part of the noise, eluding detection by standard spectrum analyzers. Or weak signals from a GSM-based listening device can get overshadowed by stronger signals and not be detected by traditional spectrum analyzers. "Going through spectrum is a tedious process," says Murray. "Even after you get through it all, you're not sure you've seen everything. What if a signal is inside another and is being blocked in such a way that the spectrum analyzer can't pick it up?" For a company like Murray Associates, uncertainty can be extremely bad for business. Similarly Murray faces challenging detection environments with a lot of noise in the airwaves. One example is a defense-related client that conducts radar work on-site and is continually flooded with powerful radar signals that cause a jamming issue. Murray has found that traditional swept spectrum analyzers weren't up to the task in this environment, forcing his inspection team to laboriously search every inch of the facility. "Our confidence level is sky high. Some instruments save time. Others increase effectiveness. This one does both." Another challenge is that some of the more sophisticated eavesdropping devices may employ "store-and-forward" digital technology. This mode of operation digitizes the sound and compresses the digital record. Then either at a pre-determined time, or on command, the device transmits the digital record as a short burst of modulated RF. These bursts may occur at random times, so finding them with traditional swept spectrum analyzers can be almost impossible. To enhance customer confidence and build trust, Murray prefers to engage and educate his customers about counter-espionage technology and instrumentation. While traditional spectrum analyzers offer a visual display, it's a dull monochrome display that provides little in the way of meaningful information to the nonexpert. 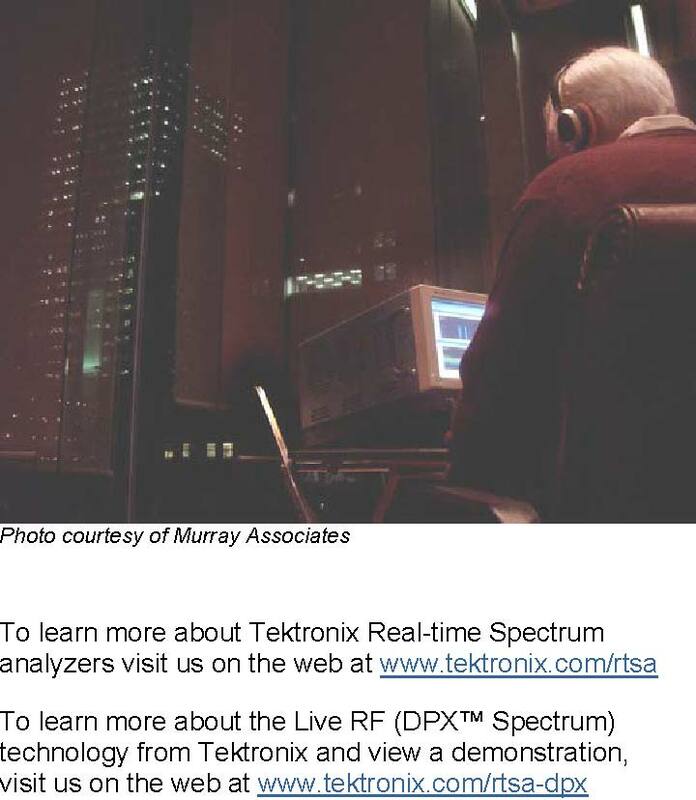 To dramatically increase his level of confidence in pinpointing wireless listening devices, Murray turned to the Tektronix Real-Time Spectrum Analyzers class of instruments with their unique live DPXTM spectrum display. As Murray soon discovered, the DPX capability is a powerful ally in his mission to track down even the faintest signal where one shouldn't be. One reason is that the DPX capability can process more than 48,000 spectrum measurements per second. This ensures that Murray can spot short duration events. The RSA6114A has 100 percent probability of intercepting and displaying signals as short as 24 microseconds. In contrast, conventional swept spectrum analyzers typically don't exceed 50 spectrum measurements per second, opening the window for a signal to elude discovery. The signal discovery advantages of DPX display technology, according to Murray, are particularly useful in spotting the unexpected transient anomaly or finding signals hidden within or behind legitimate signals. Unique to Tektronix RTSA, DPX technology provides an intuitive, full-motion, full-color display. The use of color makes it easy to visually identify the noise floor, stronger signals, weak signals and transients. By contrast, the monochrome display of a swept analyzer is only able to capture and display the tallest signals, but not weaker signals-the ones that are most likely to be an eavesdropping device. For Murray's team, which needs to conduct sweeps in a thorough, yet fast and efficient manner to meet customer demand, the DPX technology has been nothing short of revolutionary. "With the RTSA we can immediately see what's going on," Murray comments. "Our confidence level is sky high. Some instruments save time. Others increase effectiveness. This one does both." One important attribute of surveillance monitoring equipment is sufficient dynamic range and selectivity to avoid jamming from large signals closely located to the desired frequency. Strong interferers or adjacent signals within the band of interest can create intermodulation in the analyzer that prevent successful demodulation of the desired signal. Unwanted intermodulation also tends to clutter up the spectrum with meaningless signals that slow the spectrum survey process. The RTSAs, in contrast, have 73 dB of spurious-free dynamic range at the full bandwidth, which enables the analyzer to handle virtually anything spies can come up with. In the case of the radar manufacturer, the DPX technology has enabled Murray's team to easily see low-level signals despite the presence of strong radar signals that were jamming traditional spectrum analyzers. DPX reduce the need to conduct inch-by-inch physical searches, thus saving time and money while improving effectiveness. Another bonus of the DPX view is that it is easily understood by Murray's clients. 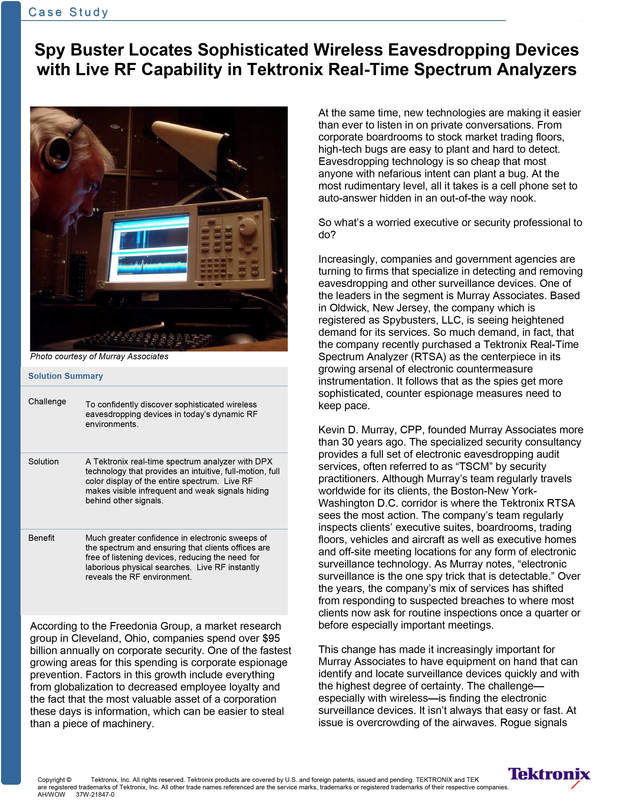 "When we show clients the RTSA they are first blown away by how much RF activity there is in their building, and then when they can see firsthand things like low-noise signals and sudden spikes, they gain a great deal of confidence in the technology we're utilizing," says Murray. Among those clients are companies in the financial services industries. In the wake of recent scandals around insider trading and the subsequent increase in regulatory oversight, financial services companies are employing companies like Murray Associates to keep sensitive information from leaving the premises. Stock trading floors, for example, now prohibit the use of all cell phones during trading hours. With its live DPX display, the RTSA gives Murray's team the ability to spot even the briefest of cellular-band transmissions instantly. Beyond finding hidden signals, the RTSA can track down many other signals potentially used in eavesdropping transmissions, including frequency hopping signals, spread spectrum signals, Ultra Wide Band (UWB) signals, burst transmission signals and unexpected spurious emissions. The instrument also delivers the ability to analyze digital signals. "The RTSA has put us miles ahead. There's no one who can touch us. The ability to see signals within another signal...you're not going to get that from anyone else." In addition to DPX technology, the RTSA offers frequency mask trigger capability that allows the user to trigger a measurement based on the occurrence of a unique pattern of events in the frequency domain. This is especially useful for the store and forward class of eavesdropping devices. The instrument's high dynamic range also allows triggering on weak transient signals while ignoring strong known signals, saving time and increasing efficiency. Digital RF refers to the advances in digital signal processing combined with strides in analog-to-digital (ADC) and digital-to-analog (DAC) technologies that have enabled the creation of next generation networks and systems. Digitized communication signals such as those in today's DSP-based RF devices have greatly advanced the state of the art for wireless LANs, RFID, cell phones, radio communications systems and radar applications. While the advances brought by Digital RF are enhancing our lives, they are also opening new, difficult-to-detect avenues for corporate espionage. GSM cell phones as bugs, available anonymously over the Internet, are one example. The Tektronix RTSAs with DPX allow discovery of signals that are commonplace in Digital RF - and potentially in corporate boardrooms. "The RTSA has put us miles ahead," concludes Murray. "There's no one who can touch us. The ability to see signals within another signal...you're not going to get that from anyone else."